Open to residents and the public alike, The Chocolate Quarter Art and Pottery Studio is one of the things that makes the Keynsham retirement village quite unique. Here Artist in Residence Joe Tymkow shares some of his story and how he's using it to inspire creativity in people of all ages. "I was a mature student. I never really thought about student loans – students are in their 20s, aren’t they? I did a Fine Art degree at UWE [University of West of England] in Bristol and graduated in 2010. Just before that I’d taken early retirement from an insurance firm where I used to work full time in a computer department. I got into black and white photography first, which I’ve explored in the background for over 30 years. I eventually set up my own darkroom at home and was doing my own developing and printing. When I started my degree the tutors took us to art galleries that were showing 10 to 15 foot paintings on the walls. They gave us the freedom to give it a go and I found it came quite naturally. One of the tutors told me I was ‘process painter’. I had to look it up… Basically it means I’m interested in how materials work and the process of creating things, rather than necessarily doing pictures of specific things. Now I consider myself a visual artist rather than a photographer. Painting is just a different medium. There really are no rules – if you can justify it, you can do whatever you like. That’s a pretty amazing thing I think. In 2015 I met Allen Richards, a ceramicist, and we formed the Keynsham ArtSpace group; a nomadic group of 25 local art and craft people in the local area. We regularly find opportunities to open pop-up shops. I’d already been invited to join the Keynsham and BANES Joint Arts Committee and during my degree I became a committee member of Fringe Arts Bath. So then when St Monica Trust began talking about creating a studio here and looking for someone to head it up they approached the council first and they contacted us. Now Allen and I run art sessions and pottery classes here in The Chocolate Quarter studio each week, which are open to both residents and the public. It doesn’t matter who you are, if you want to create something you’re welcome. It’s a very popular and happy place. Loads of the residents pop in on a daily basis for a chat and people seem to enjoy their time here. The studio is a total luxury really – it’s dry and warm for one – but there are so many great things on offer. We have several pottery wheels and our own kiln, acrylics, watercolours, oils, things for drawing, inks and all sorts of other things. There are several art groups and classes around locally. They usually meet for 2 hours in a church hall or community centre, but because they’re mixed in with other groups during the week the tutor usually has to bring all the stuff and set up beforehand and it’s all a bit of a rush. But here people can come in and continue work on the same project, without worrying about drying time and all of that. That changes the way of thinking about what you can produce. We never force anyone to take part. For me it’s about providing people with the stimulation they need to think about something in a different way. It’s largely a matter of self-confidence and enabling people to be creative and express themselves, and some of our residents are still building up to it. There are lots of activities going on all the time at The Chocolate Quarter, so some of them are very busy people. We’re expecting some new faces in the New Year though and I’m looking forward to seeing what they create." 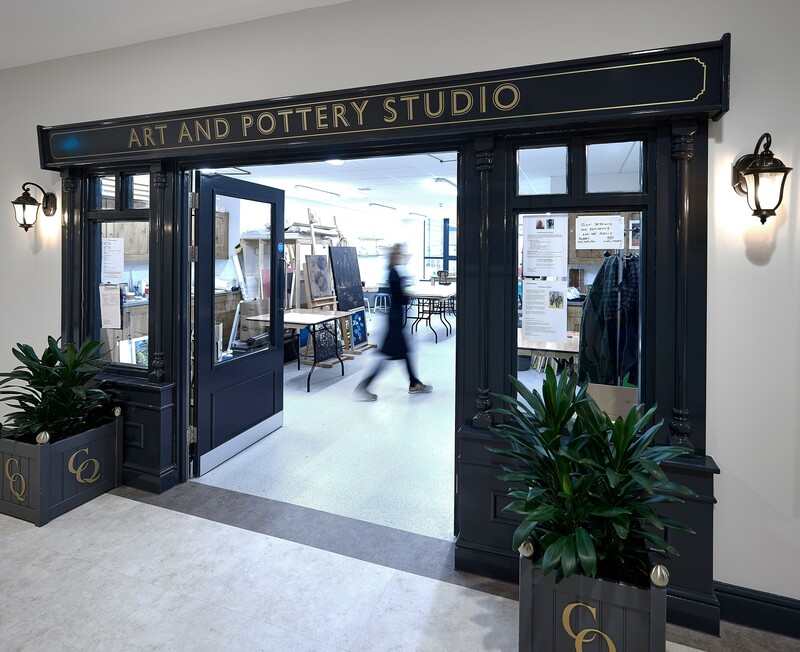 To find out more about The Chocolate Quarter Art and Pottery Studio visit our Brookmead Arcade page and if you're considering retirement accommodation you're very welcome to book on to one of our monthly retirement village tours.